Search engine optimization (SEO) and social media marketing became more closely integrated than ever in 2013, and if the past is any indication, having a correlating strategy for the two will become a must for your business in the future. 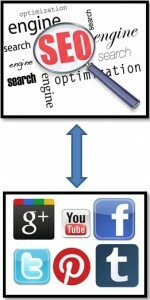 Aligning your SEO and social strategies can add value and continuity to your digital marketing in a number of ways. With SEO having new focuses around a company’s online identity, quality content, and relationships nurtured through online communities, social can only progress and help cultivate these new efforts. To aid you in this (possibly new) way of thinking, I’ve outlined a few strategic and technical ideas that can help you integrate your social and SEO initiatives. If you are not present on social media platforms for your business, you should be. This does not mean you need to create a profile for every social media site out there – look at each platform as a separate media channel (which they are) and brainstorm how each would help your business and ROI. Create a strategy and what you want to accomplish for the platforms that make sense for your business and make sure you completely fill out the “profile” or information sections with the idea that it will enlighten and engage your customer base. 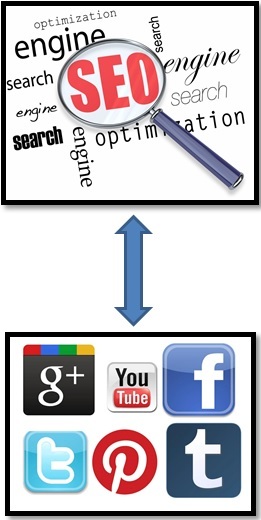 Include links to your website and the social media platforms you own within your various social media profiles. This not only helps customers find other areas online where they can engage and learn about your business, but it also helps Google and other search engines understand what you “own” online. Bing recently announced the ability to track social profiles in Bing Webmaster Tools with Connected Pages, which will more than likely be extremely helpful after the “not provided” changes from this past year that changed the way many look at SEO. Connected Pages allow you to access impressions, clicks, and other engagement factors for your social media channels, gaining insight that can help streamline and focus your social media marketing. Google Analytics offers insight into your Social Data with Social Activities, Social Referrals, and Social Interactions – all of which can collect, process, and report on your business’s social media channels. You can utilize their social data hub to integrate your social data with Google Analytics, or you can always implement utm_source tracking to identify the source (such as Facebook or Twitter) of specific traffic data. Aim for continuity within your different marketing areas – your content team, social team, and SEO team should all be in continuous conversation as you work through strategies for each area of your marketing plan. As you choose keywords to focus on for SEO, utilize those aspects in your social strategy – as you create content for different channels, make sure it is optimized for search engines and shared across the different social platforms. With a strategic mindset, alignment across media channels, and an environment that encourages collaboration, your company’s SEO and social media marketing strategies will complement and thrive together, engaging your audience and providing you with a return on your investment. Find me on Twitter or Google+ to discuss further or reach out with questions.